California Stroke: A Verdelho/Vermentino “skin contact” blend from Sierra foothills fruit. Leaving the juice on the skins gives white wines richness and often different flavor profiles: In this case, lemon, grapefruit and neroli, followed by key lime, honeydew melon, and the almond and honey notes that are often found in skin-fermented whites. This label, a typical Tank Garage valentine to California culture and vintage vehicles, was designed by Jerome Rochette. Chrome Dreams: In their continued quest to pay homage to vintage cars, these guys managed to pull off this unique and gorgeous chromed-glass bottle. As for what’s inside, it’s hard to see through as well. A dense, deep-dark blend of the Cabernets Sauvignon and Franc with a little Petite Sirah. Cassis, caramel, licorice, a supple, velvety mouthfeel, super-long finish. Like You Stole It: A big bad leathery Mourvedre based blend that’ll hit you with black cherry, tobacco, white pepper, smoke and strawberries. In spite of which, the palate is fresh and bright, with a mouth-coating character and a strong finish. The wine equivalent of a muscle car, theis bottle’s appropriately labeled with a photo of a 1969 Dodge Charger. Nothing Gold Can Stay: Napa Valley Writ-Large Chardonnay. For those of you who require a Chard to be a gaunt, gravelly French-speaking type, avert your eyes, this is a paean to the Napa valley “crème brulee in a bottle” style of Chardonnay. There are many really obnoxious iterations of that but this is not one of them! Delish. Beautiful Robert-Frost-Quotin’ label art by T-Kid (Julias Cavero). The Heavy: Napa Valley Cab-and-Friends blend and as the name suggests, not a shrinking violet. Plush and voluptuous with wild berry, chocolate and vanilla notes dominating. The label features a screen print of a rare 1898 photo of John L. Sullivan, the “first and last heavyweight champion” of bare-knuckle boxing. Nuff said? A great shot of the Tank Garage facility at night. 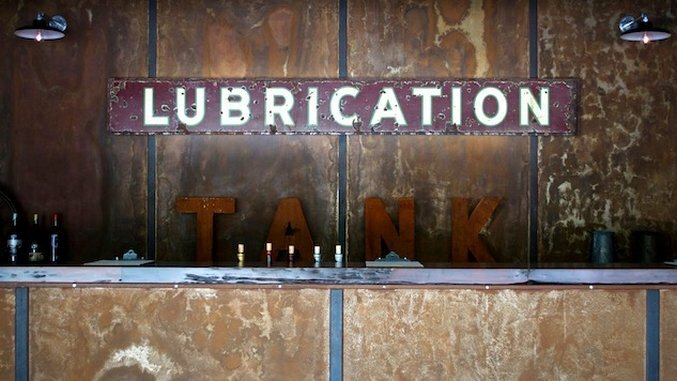 In the rustic yet mystical and more than a little seismically unpredictable land of Calistoga CA, this reclaimed 1930s service station is now making high octane fuel, not just dispensing it. Pretty sure this speaks for itself. Two longtime friends, both with roots in agricultural families, decide to combine forces, after decades of collective experience in farming and creating world-class wine, decide to write a Romantic ode to the heart and soul of vintage California culture and creativity. One 1930s gas station and lots of grapes later, Tank Garage Winery is born. Tank Garage is not Robert Mondavi. These are not large-scale, dependably consistent, drag-and-drop bottles. They rotate a small collection of “one off” uniquely-crafted wines that draw heavily on the owners’ personal lifestyles and experiences. This is the other California wine country, a little feral, a little rustic, a little unpredictable, and a whole lot of authentic and creative and experimental and artsy. When you’re not one of the old-guard big dogs, you find you’re free to be whoever you want to be, and that it’s ok if who you want to be is a moving target. We are constantly influenced by our changing environment. Grapes know this. Yeasts know this. Oak trees know this. And that’s the spirit being tapped into at Tank Garage. Go for the new, give tradition a big fat smooch: It’s all good. Sometimes really, really good!